Polished Silver Tone Lapel Pin features the Dallas Theological Seminary seal. 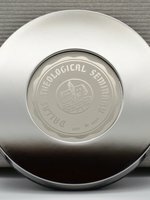 Polished Silver Tone Money Clip featuring the Dallas Theological Seminary seal. 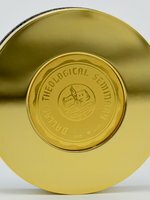 Gold Plated Polished Paperweight featuring the Dallas Theological Seminary seal. Polished Silver Tone Finish Paperweight Dimensions: 2 1/2" Diameter. Gold Plated Two Sectional Key Ring featuring the Dallas Theological Seminary seal.